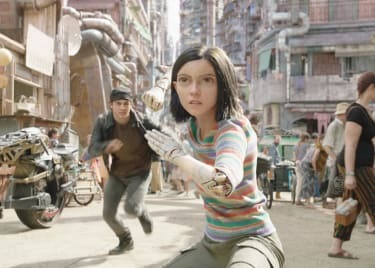 Director Robert Rodriguez (SIN CITY) and producer James Cameron (AVATAR) bring us the wild and wonderful world of ALITA: BATTLE ANGEL. Based on a popular Japanese comic book series, the story, set in a dystopian future, follows a brilliant scientist who discovers the remains of a robotic woman in a scrapyard. He puts her back together and names her Alita. On her journey toward remembering who she is and where she comes from, Alita finds new friends and fierce enemies — some of whom are human and several that are more metal than man. 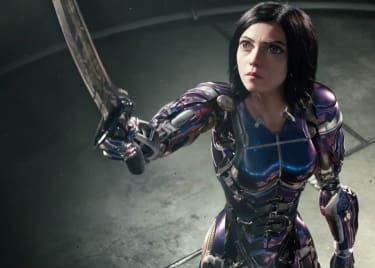 Featuring spectacular special effects and an all-star cast of favorites, ALITA: BATTLE ANGEL, opening February 14, is primed to be one of the first big hits of 2019. Here’s the human and robot cast of this exciting new cinematic adventure. Played by Rosa Salazar (MAZE RUNNER: THE DEATH CURE) via motion-capture, Alita is a cyborg with no memories of her past life or where she came from. 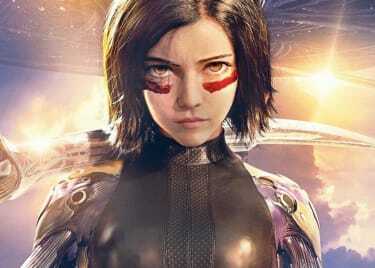 The only thing she seems to remember is how to fight — and she’s an immensely skilled and powerful martial artist, which indicates that there’s much more to Alita than meets the eye. 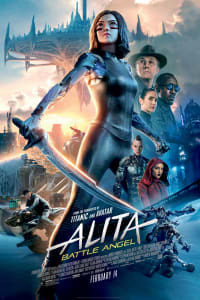 Christoph Waltz (INGLOURIOUS BASTERDS) is Dr. Dyson Ido, a brilliant robotics doctor who finds Alita in a scrapyard while scavenging for parts and decides to give her a new body. Ido becomes Alita’s caretaker and father figure and tries to help her find her place in this new, post-apocalyptic world. Dr. Chiren is Ido’s former romantic partner. Played by Jennifer Connelly, Chiren is also an intelligent scientist. Along with Ido, she escaped from Tiphares — a floating city above that houses upper-class citizens — once they learned the sinister truth behind its utopian exterior. Now living on the ground below, Chiren has become disenchanted with the concept of freedom. “Nashville” star Keean Johnson plays Hugo, a human and Alita’s first real love interest. He teaches Alita how to play the intense spectator sport known as Motorball — a gladiator-style game that pits cyborgs and robotically enhanced humans against one another. Academy Award® winner Mahershala Ali (currently starring in HBO’s “True Detective”) plays Vector, a man who makes a living by rigging the Motorball matches. Zapan and Nyssiana are a pair of formidable cyborg assassins tasked with tracking Alita down and killing her — yet another indicator that Alita has a very important past. They’re played by Ed Skrein (DEADPOOL) and Eiza González (BABY DRIVER). Based on a character from the original ALITA anime movie, Grewishka is a massive cyborg played by an unrecognizable Jackie Earle Haley (WATCHMEN) via motion-capture performance. The anime version of the character was a former Motorball champion who had a bounty placed on his life after developing a murderous habit. As we learn more about Alita’s past, one of the big connections is to her experiences on Mars and the tutelage of a cyborg warrior named Gelda, played by Michelle Rodriguez of FAST & FURIOUS fame. Rodriguez previously starred in director Robert Rodriguez’s MACHETE films. Alita: Battle Angel bursts into AMC® theatres on February 14.